In this second installment of our two part series on rate review, we’ll take a closer look at transparency, requirements for an “effective” state program, and how the rate review grants program is helping states improve their review processes. Transparency is an important element of the Affordable Care Act (ACA). The rate review provision of the ACA provides an “unprecedented level of scrutiny and transparency to health insurance rate increases” to protect consumers from unjustified premium increases. Consumers in all 50 states will have access to the proposed rate increases, an explanation from the insurer as to why it believes an increase is necessary, and, for the first time, be able to comment on the proposed rate increase. After analysis and public comment the final determination, and the reasoning behind it, are made public. Rate review information is available on HealthCare.gov at: http://companyprofiles.healthcare.gov/. You can look up proposed rate increases by insurance company or overall by state. The transparency that the rate review program provides not only protects consumers from unjustified rate increases, it promotes competition and encourages insurers to keep costs down. It builds on other provisions (such as the Medical Loss Ratio 80/20 rule) and aligns with the ACA’s goal to make health care more affordable. Must receive sufficient data and documentation concerning rate increases to conduct an examination of the reasonableness of the proposed increases. Must make a determination of the reasonableness of the rate increase under a standard set forth in State statute or regulation. Must post either rate filings under review or preliminary justifications on their websites or post a link to the preliminary justifications that appear on the CMS website. Must provide a mechanism for receiving public comments on proposed rate increases. Must report results of rate reviews to CMS for rate increases subject to review. Forty-four states and the District of Columbia have rate review programs that the HHS has deemed “effective.” Some states have the power to deny or modify the proposed rate increase if it is deemed unreasonable. Other states can determine the rate is unreasonable, but don’t have the authority to stop the insurer from implementing the increase. HHS will review proposed rate increases for states that do not have an “effective” review program, but it lacks the authority to deny rate increases. The $250 million Rate Review Grants Program is designed to provide states with funding to improve their rate review programs. These funds have made it possible for states to build and improve the quality and efficiency of their rate review programs and provide consumers with greater transparency and protection from unjustified rate hikes. HHS anticipates awarding additional funds in 2012 and 2013 to help states further improve their ability to protect consumers. According to the 2012 Annual Rate Review Report: Rate Review Saves Estimated $1 Billion for consumers, the rate review grants program has helped 21 states expanded the scope of their rate review efforts, 41 states have improved the quality and efficiency of their rate review process, and 42 states have increased consumer transparency. In addition, it has helped states empower consumers with information that was previously not available. Before the ACA most consumers were left in the dark regarding premium rate increases. Many experts believe this lead to insurance company abuses and unnecessarily high premiums. The Rate Review Program and the Rate Review Grants Program have helped states provide consumer protection by analyzing and disclosing proposed double digit rate increases to consumers. Visit Extend Health to use the ExtendExchange™ platform – the nation’s largest private Medicare insurance exchange. Health insurance premiums have grown rapidly over the past decade, and, in most cases, insurance companies were not legally required to justify rate increases to consumers. Now, to comply with the rate review provision of the Affordable Care Act (ACA), insurers must submit proposed double-digit premium increases for review by the state or the U.S. Department of Health and Human Services (HHS). Rate review helps ensure that premium increases are based on realistic costs. Insurance companies in small group and individual markets that want to raise premiums 10 percent or higher are required to submit justification for the increase for review. The state Department of Insurance (DoI) reviews each proposed rate increases to verify that it is reasonable, and make the information about the review available to the public. If the DoI does not have an “effective” rate review program, HHS will review the proposed increase. This scrutiny and transparency promotes competition, motivates insurers to keep health care costs down, and protects consumers from unjustified rate increases. Fifty percent of the rate review determinations made so far have resulted in either a lower increase than originally proposed or no increase at all. On average, rate increases implemented were 2.8% lower than the proposed increase. To date, rate review has saved consumers in the individual and small group markets an estimated $1 billion, and resulted in lower premium increases for nearly 800,000 people. In its October 2012 report Quantifying the effects of Health Insurance Rate Review The Kaiser Family Foundation analyzed rate review data from 32 states and the District of Columbia. Kaiser found that 20 percent or the rate filings “resulted in lower premium increase than the insurer initially requested.” The KFF study also found that rates varied by market (individual or small group) and by state. Source: Quantifying the effects of Health Insurance Rate Review, by Kaiser Family Foundation. While review programs were in effect in many states prior to the ACA, rate hikes often faced little or no scrutiny. The rate review program under the ACA provides much greater scrutiny and transparency, and helps to protect consumers from unjustified premium increases. In part two of this series on rate review we’ll take a closer look at transparency, requirements for an “effective” state program, and how the rate review grants program is helping states improve their review processes. On August 22, 2012 CMS Announced 500 primary care practices that will participate in the Comprehensive Primary Care (CPC) demonstration project in a new partnership between payers and primary care providers. Backed by the ACA, the goal of this multi-payer initiative is to deliver better coordinated, higher quality, patient-centered care, and to reduce costs. The CPC’s goal was to enroll about 75 primary care practices in several regions spanning eight states: Arkansas, Colorado, New Jersey, New York, Ohio & Kentucky, Oklahoma, Oregon. Practices were chosen in a competitive process based on several criteria. Diversity of geography, practice size and ownership structure. The chosen practices are to begin delivering health care services under the program in the fall of 2012, and are projected to serve over 300,000 people with Medicare. For more details and a complete list of participating primary care practices visit the CMS Innovation web site and read the CMS press release. The ACA requires Medicaid eligibility to be expanded to non-elderly people with incomes at or below 133% or the federal poverty level (FPL). It also specifies that each state must change how it determines Medicaid eligibility, as well as streamline eligibility and enrollment systems that will coordinate enrollment across Medicaid, Children’s Health Insurance Program (CHIP) and the state health insurance exchanges. The bill allows states to opt out of the expansion, but stipulates that they will lose their existing federal Medicaid funds if they do so. When the Supreme Court ruled on the constitutionality of the health care law in June of 2012, it modified the provision on Medicaid expansion by allowing states to opt out without losing their existing federal Medicaid funding. This change prompted the Congressional Budget Office (CBO) to update its budget estimates, reflecting projections that fewer people will be covered by Medicaid and CHIP, while more people will be enrolled through state health insurance exchanges and uninsured than in its previous estimate. The GAO completed its field work on this study prior to the Supreme Court’s ruling, so the impact of that decision was not included in their analysis. However, the requirements for states that choose to participate in the Medicaid expansion have not changed as a result of the Supreme Court decision and the report is still a useful snapshot of how these states are getting on with preparations for it. Table 1: ACA provisions included in the GAO study. Medicaid eligibility Expand eligibility to non-elderly people with incomes at or below 133% of FPL. Modified adjusted gross income (MAGI) Transition to using MAGI to determine income eligibility. Early expansion option States can expand coverage to newly eligible people prior to January 1, 2014. Maintenance of effort States must maintain eligibility standards until an exchange is fully operational. Federal matching Federal matching funds will be provided to states for newly eligible adults. The GAO found that the states studied are taking steps to prepare for Medicaid expansion, but they face some challenges including the need for additional federal regulations and guidance. CMS has issued a final Medicaid rule and indicated that more guidance will be forthcoming. In addition, the majority of state budget directors interviewed believe the following factors will contribute to the cost of expanding Medicaid. After reviewing and commenting on the study, HHS agreed to provide states with additional regulations and/or guidance on MAGI conversion and FMAP computation. HHS also reiterated that the decision to participate in Medicaid expansion is up to the state – there is no deadline date for their decision – and federal matching funds are available to help states cover information technology costs for modernizing eligibility systems, which don’t have to be paid back if the state decides not to expand Medicaid. Extend Health held a tweet chat today on health care costs. There were some great questions and excellent answers from John Barkett, Dir. of Policy Affairs at ExtendHealth fielded questions. John worked in congress on health care and his wealth of knowledge was evident in the answers he provided. If you missed our tweet chat you can read a complete recap of the event. Hope to see you at the next one! Way to go Garland Senior Fair! 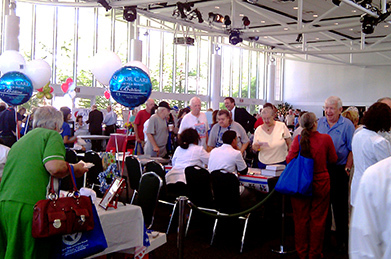 Extend Health exhibited at the Garland Senior Fair in Texas this past Sat, Aug 4. There was a great turnout of over 350 people from the community and surrounding areas including seniors, their families, community leaders and service providers like us, who care about seniors and senior issues. State Representative Angie Chen Button thanked Dwight and Ivory in person for exhibiting at the fair, fulfilling an invitation that she extended to Bryce Williams, Towers Watson Managing Director of Extend Health, at the ribbon-cutting of the first Extend Health service center in Richardson this past May. Richardson Mayor Bob Townsend encouraged everyone to make good use of the resources available. And many other community leaders, including City of Rowlett Senior Advisory Board members Pamela Bell and Wayne Baxter, met with attendees and the community groups and companies exhibiting. Dwight Turner and Ivory Rooks, both senior benefit advisors for Extend Health, who have years of experience helping seniors choose the best Medicare plans for them, served as Extend Health ambassadors. They answered people’s questions about Medicare and shared resources with them, explaining the role Extend Health can play in helping to connect people with the best coverage for their needs. Extend Health contributed a Texas-themed gift basket, which was raffled off to a lucky winner. The day was welcome chance to connect in person with many in a community that is very important to Extend Health. We recently announced that Extend Health is bringing over 500 jobs to the community with the opening of its second service center in the Richardson Telecom Corridor. Back in December of 2011 the U.S. Department of Health and Human Services chose 32 organizations to participate in the Pioneer Model test initiative that stated on January 1, 2012. On July 9th, HHS announced 89 new ACOs that will serve 1.2 million people with Medicare in 40 states and Washington, D.C. The program overall now includes 154 ACOs that are providing care to 2.4 million people. ACOs consist of doctors, hospitals and other health care providers that work together to deliver high-quality health care and reduce costs. Participation in this shared savings program under the ACA is voluntary, and providers are incentivized by the opportunity to share in the savings they help create. ACOs must meet 33 quality measures to insure that the savings generated result from improving the coordination and quality of care. Not all ACOs are large organizations. Nearly half are physician-driven with less than 10,000 beneficiaries. The program is estimated to save the federal government up to $940 million over four years. Read the full post on Watch This. Back in August of 2011 we wrote about a new program from the U.S. Department of Health and Human Services (HHS) called the Bundled Payments for Care Improvement initiative that would allow multiple providers to bundle payment for services a patient receives for a single “episode of care,” such as heart bypass surgery or a hip replacement. The program was designed to incentivize health care providers (hospitals, doctors, clinicians, etc.) to work together to reduce costs and provide better care. As part of our ongoing interest in measures to reduce health care costs, we’re posting this summary of trends in bundled payments. Bundling payments is not a new idea. The first large scale CMS pilot of bundled payments was Medicare’s Heart Bypass Center Demonstration that ran from 1991 to 1996. It saved Medicare over $42 million and saved patients nearly $8 million. It also improved the quality of care and lowered hospital mortality. Health Care Incentives Improvement Institute (HCI3) recently released a report titled Bundled Payment Across the U.S. Today. They found that the most common reasons for choosing a procedure or condition to bundle are based on cost, how easy it is to define and implement the bundle, and how it aligns with existing initiatives. In the future, bundles may also be influenced by those adopted by Medicare. Procedural inpatient conditions like hip and knee replacement make good bundle candidates because they are easy to define and standardize. Chronic conditions like diabetes are more difficult to bundle than procedural conditions, but offer the greatest opportunity to generate savings by bundling. Among bundles created by providers and payers in the HCI3 study, there were few for outpatient procedures and none for acute medical conditions. Bundles are defined by the services include, the time period covered, and patients included. After defining the bundle, payers and providers negotiate its price. Defining a bundle is complex and can take a great deal of time and effort for providers and payers to analyze and come to an agreement on the final definition. Bundle rates can be defined as risk-adjusted or flat-fee; risk-adjusted rates vary with the severity of the patient’s condition, while flat-fee rates stay the same for every patient. There are two types of payment bundles, retrospective and prospective, and four broad models for bundling payments. Payers and providers work together to determine the episodes of care and services they want to bundle together based on what works best for them. Payers send spending reports to providers on a monthly or quarterly basis so providers can keep track of the amount spent on the bundle. Payments must be reconciled at the end of an episode to make sure claims are associated correctly with the bundle. While quality measures were being used in various ways, only one of the participants in the HCI3 study was using them to adjust payment amounts, because it is difficult to find acceptable quality measures that can be directly tracked to spending. Risk and savings are used to incentivize providers to increase the success of bundled payments systems. There are three types of savings/risk arrangements. Shared savings – incentivizes the provider to reduce spending below the negotiated bundled rate by letting them share in the savings. Shared risk – incentivizes the provider to reduce spending by putting them at risk for costs above the negotiated bundled rate and letting them share in the savings. Full risk – puts the provider at full risk for all costs above the negotiated bundle rate, but allows them to keep all of the savings. Bundled payments are gaining in popularity, but the volume remains low because of the high number of exclusions negotiated between payers and suppliers, and issues with lack of continuous enrollment. It may be too early to draw any definite conclusions, but there are early indications that bundled payments have delivered some cost savings. Decreased readmissions, complications and mortality have been reported too. Many are using their early experiences with bundled payments to help them prepare for the future and develop new payment and risk-sharing strategies. Visit Extend Health to use the ExtendExchange™ platform – the nation’s largest private Medicare exchange. According to a recent Kaiser Family Foundation report, this summer individuals and employers are expecting to receive $1.3 billion in health insurance rebates from insurance companies who did not meet requirements of the Medical Loss Ratio (MLR) provision of the Affordable Care Act (ACA). Under the health care law, insurers are required to pay rebates to consumers and employers if they do not comply with the MRL regulations. The MLR requires insurance companies to spend a specified percentage of their income on health care claims and quality improvements. The remaining income can then go to covering administrative expenses, marketing and profits. If too much goes toward the latter, the insurer must pay rebates. These rebates act as an incentive to improve quality and seek lower premium increases. There are two MLR thresholds. The rebates won’t make health insurance more affordable, but that’s not their purpose. The goal is to make insurers better align their premiums with their medical claims costs, forcing them to be more efficient and preventing them from charging too much.